Value stream mapping is a lean management tool that helps visualize the steps needed to take from product creation to delivering it to the end-customer. As with other business process mapping methods, it helps with introspection (understanding your business better), as well as analysis and process improvement. The inputs for a values stream map include all the resources you leverage to produce goods or services. The route you follow consists of value adding steps, as well as their attendant non-value-adding steps. And your map will also follow information flows. How to Use a Value Stream Map? While value stream mapping is usually used for manufacturing processes, the same principles can apply to other industries too. First up, you need to decide what you want to map. In some businesses, one value stream map can cover just about everything the company does. This is especially true if your company produces a single product. If you have a complex mix of products or services, however, then you’d have to draw a separate map for each. With which process you’d start is, of course, up to you. Generally, though, you’d want to start off with the highest value areas. To actually carry out the mapping, you’d want to gather a small project team consisting of representatives from different departments. They have a first-hand perspective on how things are done, and how well the current system works. You might even figure out several ways to improve the processes without even consulting the value stream map. Next up, you need a facilitator. This could be a senior manager who understands value stream mapping, or you can get an external consultant to help you. As you work, you will create your map – but be ready to make changes as you go. Someone may just remember a missed step somewhere along the line, and that can change the whole picture. Pen & Paper – the simplest solution, just grab an A3 paper & a pencil and get to work. Flowchart Software – dedicated tools used for all sorts of business process mapping. Workflow Management Software – custom solutions for managing company workflows. In addition to simple mapping capabilities, you can also keep track of and manage the workflows. Symbols help with your visual overview. They show exactly what kind of step you are dealing with. While you could always come up with your own symbols, it’s usually easier to find an already established style and stick with it. The symbols are usually pretty intuitive – a simple line drawing of a pair of spectacles, for example, indicates that someone has to “go and see,” while a truck indicates transport. Typically, you would start your mapping by indicating a start and end point. This would show where your internal process begins and ends. Some companies, however, prefer to map out the entire value chain. This, of course, has it’s pros and cons – while it does give you a better idea of the whole process, there’s usually not much you can do about any external processes. Your average value stream map begins with the delivery of materials from direct suppliers and ends with delivery to the customer. Place the icon you have chosen to represent your starting and ending points on the left and right of your map. Now determine what processes are involved in order to get from point A to point B. 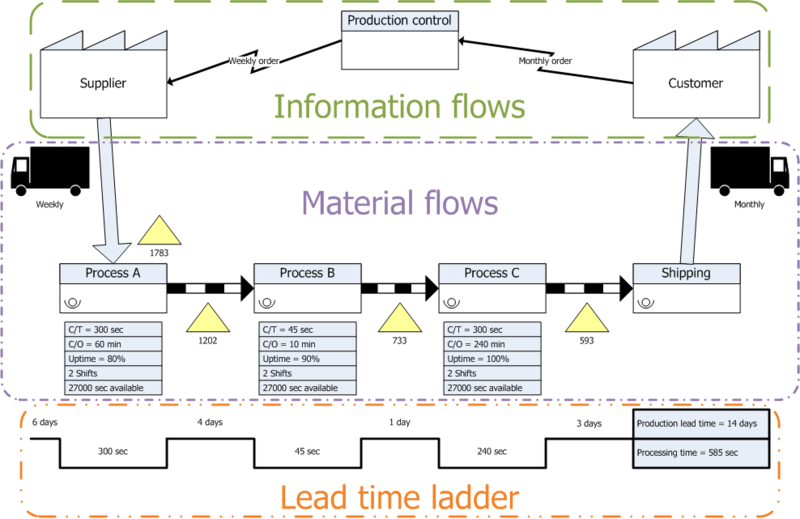 One of the advantages of value stream mapping is that it includes information flows. To continue with the example above, our plant nursery needs to place orders for its suppliers and its customers will place orders for delivery. How often is this done and how? Record it on your map. The teams or individuals responsible for each process that takes the product from input to output also needs information. Where does it come from and how is this information passed on? Perhaps our flower grower has a centralized planning department which receives sales information and places orders with the seed supplier. It then uses this info and provides a weekly or monthly schedule for each of the processes. Add this department in the middle of the sheet between the input and output blocks, draw another block below it to indicate the weekly plan, and draw arrows from the plan to each of the departments it informs. Once you have all the information, you can start adding it to your map. Draw a table or data box under each process block to do so. If you’ve used historical data, be sure to verify it using the current inputs and outputs for each process. Indicate the timeline involved in each process beneath your data blocks. This shows the lead time needed to produce products and the actual time spent on producing each unit, pack size, or batch. Don’t be surprised if a product with a lead time of weeks takes just a few hours to produce. Just creating a value stream map without using it would be a complete waste of time. Now that you have one, it’s time to start looking for the “seven wastes” that could be eating up your profits. Transport doesn’t add value to your final product – unless you’re in the transport business! See if you can reduce steps involving transport of materials or information that don’t add value. Inventory of inputs and finished products costs you money which could have been earning income elsewhere. The lower your inventory levels can be without stonewalling production, the better it will be. Motion costs time and time is money. As an example, our nursery worker has to move her transplanted seedling 10 feet from the potting table to the tractor wagon. That’s wasted time. Waiting because there’s a bottleneck in a previous process or sub-process is another clear waste of valuable resources. Over-processing can be hard to gauge, but if an item can move from one process to another in an acceptable condition with less input, it should do so. Overproduction is an additional pitfall to avoid. Even if your product isn’t perishable, storing it and monitoring it until such time as a customer buys it is clearly a waste. Defects mean reworking or scrapping and are clear money-eaters. 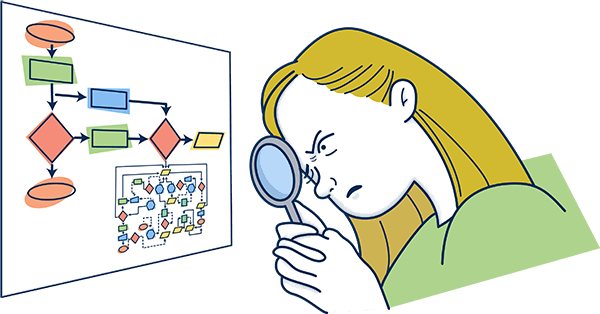 How can you reduce defects in each step of the process you’ve mapped? You know how things are if you maintain the status quo, but how would you like them to look? Use your team to help you map out an ideal value stream map that eliminates, or at least reduces, all the wastes you spotted when analyzing the results of your value stream mapping exercise. It’s unlikely you’ll be able to get there in one step, so you can create a series of intermediate future state maps. Your business would aim to reach these milestones at specific dates, and ultimately, they’d reach the goal you identified when you drew up your ideal state map. What should you do now? Start the mapping process all over again! Few processes are so perfect that there’s no more room for improvement! Your aim is nothing less than operational excellence. The one drawback of value stream mapping done the old-fashioned way is the time that elapses between report-backs and meetings. For those hoping to slim down process flows fast, this can be frustrating. There’s also the matter of monitoring the effects of changes you’ve decided to implement. Unforeseen, and possibly unwanted, consequences can flow from new parameters – or people could simply be getting it wrong because they aren’t used to the new work method yet. The best way to have that fix and speeds things up is adopting the right technology. Tallyfy is a workflow management tool that can help you with process mapping and data gathering. To boot, it can also help enforce your new processes. So, why don’t you give the free demonstration a try? Video Guide – What is Value Stream Mapping?